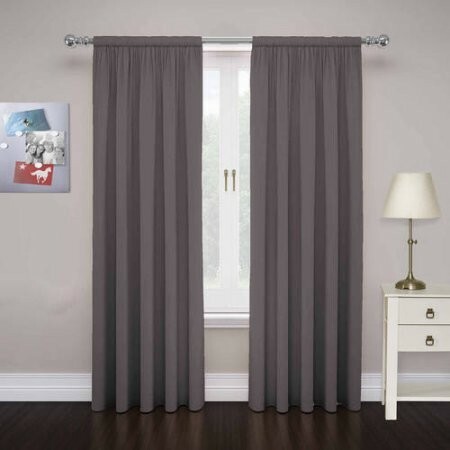 Pairs to Go Cadenza Microfiber Window Panel, Set of 2, 40" x 84"
Update any living space with these decorative Pairs to Go solid microfiber curtain panels! Perfect for the living room, dining room or bedroom, these versatile curtains are an easy way to add color and style when decorating your home. Each package includes two easy-to-hang rod pocket curtain panels. Hang two curtain panels on decorative or standard curtain rod. Rod pocket measures three inches and is recommended with a 1-2 rod for maximum movement. Easy care, machine wash cold, tumble dry low, iron low if needed. They are made of 100 percent polyester!